After you summon a minion, give it +1/+1 and this loses 1 Durability. I dub you Sir Loin of Beef! This works perfectly against Explosive Runes. I had this in arena and played Shrieking Shroom which triggered opponents Explosive Runes. Shroom got 2 damage, my hero 4 and then Sword of Justice buffed Shroom back to life as 2/1. And of course at the end of the turn my Shrieking Shroom summoned a minion that got buff too. Is this card still a thing or is it just a trash in this meta? Well, I have a golden one, so I'm gonna dust it. if Sword is set and then I play Muster for Battle will recruits get +1/+1 or armour replacement happens befor recruits come? 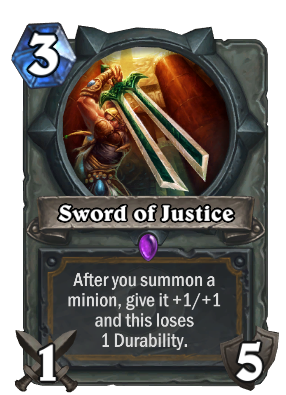 "If combined with Muster for Battle, the Sword of Justice will use up 3 charges to buff the Silver Hand Recruits before the Light's Justice created by the ability replaces it. It is inefficient to use Muster for Battle when the Sword has more than 3 charges remaining, even if that means attacking with the Sword to avoid wasting one (since an attack from the Sword of Justice does the same damage as one from the Light's Justice that will replace it)." Also gives great value in Arena games !! do you like golden animation? I hate losing to this card..